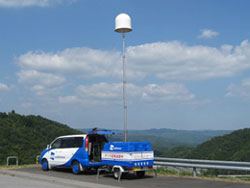 Weathernews Establishes Compact Adaptive Mobile Radar Network – Weathernews Inc.
Weathernews Inc. (Tokyo, Japan – CEO: Chihito Kusabiraki) has initiated the establishment of an innovative network of compact and adaptive mobile radar for detecting regional, fast-changing meso-scale weather phenomena that adversely affect transportation. 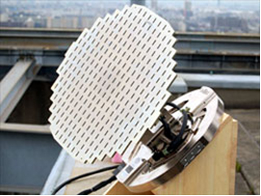 Dubbed WITH Radar, the innovative radar network uses compact and adaptive mobile radar to forecast tornados, gust winds, heavy snowfall and “Guerilla Thunderstorms.” The first of its kind in the world, WITH Radar refreshes data from variable areas with a high refresh rate, providing coordinated data that is unobtainable with fixed radar networks. 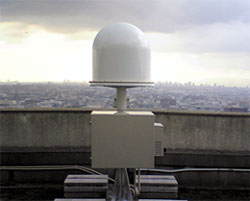 The need for this type of radar network was recognized in 2005 after industries managing road, rail and air transportation participated in a discussion hosted by Weathernews on how to reduce risk to these modes of transportation through the study of “transportation weather.” Currently, Weathernews is able to observe nearly all of Japan through a licensed experiment in the application of WITH Radar. The detection of suddenly appearing of rain clouds that lead to phenomenon like Guerilla Thunderstorms has met with success, and the network will continue to expand with dozens more locations across Japan. Weathernews hopes to develop the know-how useful for forecasting and safety together with transportation industries through this endeavor. As a matter of course, the possibility even more detailed and accurate data in the future is eagerly anticipated. This will be applied together with a state-of-the-art tornado prediction model developed in collaboration with the University of Oklahoma. The joint research will ultimately lead to the creation of new Weathernews services aimed at improving the safety, comfort and time-savings of commuters and transportation infrastructure. The trend in recent years of increased phenomena like Guerilla Thunderstorms, tornados, wind gusts and heavy snowfall that may suddenly occur in highly localized area has had a large impact on different modes of transportation and the supporting infrastructure. Reports of cases involving damage are not uncommon. In 2005, the derailing of a passenger train in Yamagata Prefecture was attributed to rapidly changing weather conditions. The Transportation Weather Forum was founded by Weathernews with the goal of preventing tragic disasters like this. The Transportation Weather Forum involves the participation of industries related to the management and maintenance of locations used by modes of transportation like road, rail and air. With Oklahoma University Professor Emeritus Dr. Yoshikazu Sasaki heading the project as an advisor, the need for an adaptive mobile radar network capable of detecting rapidly changing regional phenomena like Guerilla Thunderstorms and heavy snowfall has been discussed as a countermeasure against the weather-related risks that effect all transportation industries and infrastructure. Getting data on fast-changing regional weather phenomena that affect transportation is the goal of the WITH Radar project. 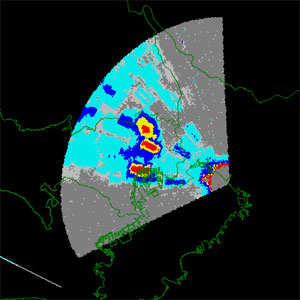 From 2007, Weathernews has been accumulating know-how for the next generation radar observation technology and method of application with the research and development contributions from the US-Based CASA Project (The Center for Collaborative Adaptive Sensing of the Atmosphere.) Rain clouds that bring sudden severe rains in a highly localized area can appear and disappear within an extremely short period. Current existing radar installations have difficulty detecting and charting the development of this type of cloud. However, the newly developed compact and adaptive radar has the capability to detect this phenomenon which standard doppler radar does not. In addition, multiple radars in a networking arrangement makes it possible to quickly detect and track rain clouds in observation blind spots that give rise to Guerilla Thunderstorms and tornados. WITH Radar network observations are being applied in stages, and have already produced some solid results. In the winter of 2008, Weathernews hosted the Transportation Weather Forum. Some of the ideas shared like, “We need swift countermeasures for suddenly developing snow clouds and rain cloud after detection,” and, “We want to improve safety from gusts and gale winds” were put into effect. Based on these customer needs, Weathernews put the WITH Radar network to work on a trial basis. The result was the detection of low-layer snow clouds that would not have been picked up by traditional large, fixed radar installations. WITH Radar quickly detected these clouds as they developed within a short span of time. The possibility of new information for countermeasures could be seen for the first time. That summer, Weathernews used observations collected from Southern Kanto, Nagoya and Kansai regions of Japan to detect Guerilla Thunderstorms which potentially affect transportation infrastructure. Weathernews’ mobile radar was deployed by car in response to information from a combination of observation data from past occurrences, the many WITH Radar installations around Japan, and also reports from mobile phone users enrolled in the “Guerilla Thunderstorm Defense Force.” The result was a success rate of 83.5% in August when predicting Guerilla Thunderstorms using WITH Radar, versus 76.7% during the same period last year without WITH Radar. 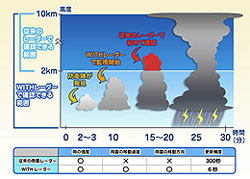 In addition, information based on the detection of a tornado in Gunma prefecture in July, and concentrated rains in Yamaguchi prefecture helped avoid secondary damage. Weathernews’ challenge for the future is to apply the expertise and experience gained from this project to the expansion of the WITH Radar network comprised of 100 locations nationwide. This would be enough to cover any blind spots in Japan’s transportation infrastructure. Currently collaborative research between Weathernews and Oklahoma University to develop a tornado prediction model will enable WITH Radar to move beyond detecting current conditions to actual forecasting applications. The successful development of forecasting with WITH Radar will enable Weathernews to provide content for further increasing transportation safety. In the world’s aviation industry, 40% of weather information is forecast and the remaining 60% is Now-cast. If observations are not accurate, we cannot make the appropriate response. Here is where we have extremely high expectation for WITH Radar. Whether we can acquire relevant data, and whether we can use this data is a critical point relating to maintaining safety. It’s not about lapses in accuracy in the data, but rather should be about the point of fusion applied to hardware and software. For safe and precise rail transport, accurate weather monitoring is essential. However, this is a limit to the detail and continuity of weather data we can acquire for railroads in real-time by using and standard weather radar installations, and rain and wind measurement instruments scattered across the region. If this ground-breaking WITH Radar network can solve these problems and keep the trains running, we expect the safety of rail transportation to rapidly improve with far fewer disasters. For highway management, “Advanced Response” based on “Advanced Forecast” is an important keyword. Until now, localized Guerilla Rains and ineffective determinations of rain clouds has been a difficult problem. Unfortunately it is normal in many cases to simply resign ourselves to the fact that much of the time responses to unexpected cases that demand a response will be off the mark. With the help of WITH Radar, the accuracy of advanced forecasts will improve. We expect this will contribute to the precise and efficient road management. We have come to understand that the existing radar installations in countries like America and Japan have difficulty detecting rapid changes in gigantic cumulonimbus clouds. In America, the CASA Project is making progress but when it comes to either medium or large dish radar, basically it’s a fixed installation. In contrast, Weathernews’ WITH Radar network is unique because it is compact and mobile. Also, it is not limited to just observing current conditions. Through joint development of prediction simulation of tornado development from large cumulonimbus clouds, we are constructing a model that can do calculations that would take current super computers more than a week to perform. There are more and more possibilities for this radar network in the future. To support research and development for cultivating academic wisdom, the CASA project was established in 2003 by the National Science Foundation in the United States of America. The goal is to develop a system of detecting lower-atmosphere phenomena like tornadoes and gust winds which are hard to detect with traditional radar systems in current operation by building a network of compact and adaptable radar installed at multiple and variable locations. Currently the network is in the trial research phase, and has not yet been fully completed.